Director Kelly Asbury (“Shrek 2”) has the task of taking this newly-renovated story and breathing life into this slightly less tragic, comedic love story for the whole family. Coming at you in 3D, the fable of the love that was never suppose to happen takes a cute and charming approach to a fun time while educating the children on the basic story that was one of Shakespeare’s greatest works of fiction. It all takes place on Verona Drive, where two neighbors Miss Montague (Julie Walters) and Mr. Capulet (Richard Wilson) are involved in a turf war. Each is trying to outdo the other in their garden’s beauty and eccentric lawn ornaments. The lawn ornaments have gotten into the feud as well, with one side against the other in an eternal struggle for bragging rights. The leader of the blue gnomes, Lady Bluebury (Maggie Smith), along with her son, Gnomeo (James McAvoy), are against the red gnomes next door. The great Lord Redbrick (Michael Caine) is the stern ruler of the red gnomes. He keeps his beautiful daughter, Juliet (Emily Blunt), in the tower over the pond, as he fears for her safety. Well, things get complicated when a midnight mission to get an orchid that would impress her father has Juliet meeting Gnomeo in a nearby garden. Each in disguise, they flirt and start to fall in love before they discover that the other is the sworn enemy of their people. Having to keep their romance a secret, they retreat to their yards but neither can forget about the other. Breaking every rule, they rendezvous in secret to help their new love blossom, but how long can they keep the relationship concealed before the two warring clans discover it and tear them apart forever? The voice talent is phenomenal in this movie. Featuring some of the biggest English actors, along with many great American stars, we get many great and unexpected voices in this movie, including: Stephen Merchant’s nerdy gnome; Ashley Jenson’s boisterous Scottish frog Nanette; Jason Statham as Tybalt, the tough red gnome who is vicious to no end; Matt Lucas as Benny, Gnomeo’s faithful pint sized sidekick; Jim Cummings as Featherstone, the love-struck, one-legged plastic flamingo; and many fun cameos including Ozzy Osbourne, Hulk Hogan, Dolly Parton and even Patrick Stewart as the great Shakespeare himself (or at least a statue of himself). I can’t talk about the movie without mentioning Elton John. His music is the backdrop for the feeling of the entire movie. With re-worked hits from his collection such as “Your Song,” “Saturday Night’s Alright for Fighting” and “Crocodile Rock” — along with a few new tunes — he helps make the canvas on which the movie is painted. Older fans will dance and sing along to these classics, while younger viewers will be humming the fun new songs well after the movie has ended. At first when I heard that Elton John was doing the music, I was a bit leery, but after seeing the movie, I saw how each one of his songs was picked very carefully to help move the story along as well as enhance the emotional score for the scene. I wouldn’t consider myself an Elton John fan, but I wouldn’t mind owning the soundtrack to this movie. Overall, I think this is a very good piece of animated artwork. The 3D effects were a really fun addition to the movie and although it doesn’t have the same feeling as some endearing animated films, it will be enjoyed just as much. With strikingly-beautiful color-filled gardens to awe at and the entertaining humor for all, I’m sure “Gnomeo and Juliet” will be a film your kids want to see over and over again. 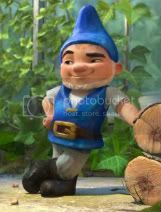 “Gnomeo and Juliet” opens Feb. 11 in 2D and 3D and is rated G.
I took my 2 daughters to go see this movie and they absolutely loved it. It’s such a cute movie. I just can’t get myself interested in this one. I was not looking forward to seeing this movie at all but with my two youngest kids begging me to see it (ages almost 10 and 5) I took them and ended up really enjoying the movie! The kids also said it is their new favorite movie!